All transactions are safe and secure with a reliable history in online purchasing behind each of our associates. 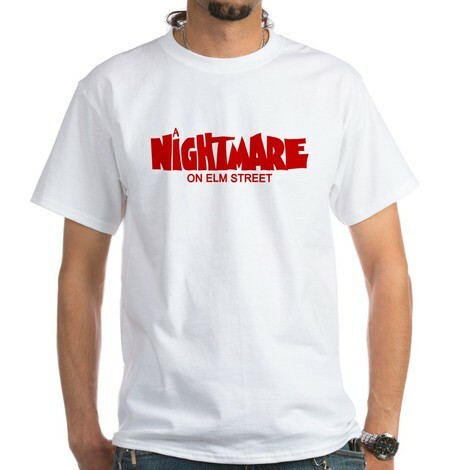 Buy the A Nightmare on Elm Street Logo t-shirt to own Nightmare on Elm Street clothing and merchandise. If you prefer the original 1984 movie to the remake, the A Nightmare on Elm Street shirt shown here features the original film's title from the poster art. Unlike Jackie Earle Haley's portrayal of Freddy in the recent remake, the original Wes Craven version delivers the comical lines that Freddy is known for, while also eliciting fear in the audience at the same time. You can be the judge on which film is better. Either way, I hope this Freddy tee satisfies your nostalgic cravings. In addition to the A Nightmare on Elm Street Logo tee above, browse the Nightmare on Elm Street Clothing Gallery for more apparel like men's and women's clothes, kids shirts or hoodies.